Interest in the science of exercise dates back to the time of ancient Greece. Today exercise is viewed not only as a leisurely activity but also as an effective preventive and therapeutic tool in medicine. Further biomedical studies in exercise physiology and biochemistry reports that strenuous physical exercise might cause oxidative lipid damage in various tissues. The generation of reactive oxygen species is elevated to a level that overwhelms the tissue antioxidant defense systems resulting in oxidative stress. 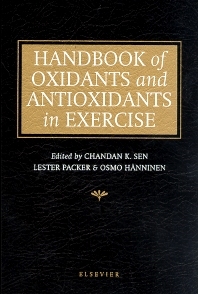 The Handbook of Oxidants and Antioxidants in Exercise examines the different aspects of exercise-induced oxidative stress, its management, and how reactive oxygen may affect the functional capacity of various vital organs and tissues. It includes key related issues such as analytical methods, environmental factors, nutrition, aging, organ function and several pathophysiological processes. This timely publication will be of relevance to those in biomedical science and was designed to be readily understood by the general scientific audience. Part I: Introduction to free radicals. Free radical chemistry (K.-D. Asmus, M. Bonifa&ccaron;i&cacute;). Part II: Reactive species in tissues. Exercise and oxygen radical production by muscle (M.J. Jackson). Exercise and xanthine oxidase in the vasculature: superoxide and nitric oxide interactions (C.R. White et al.). Part III: Oxidative stress: Mechanisms and manifestations. Chemical bases and biological relevance of protein oxidation (O. Tirosh, A.Z. Reznick). Lipid peroxidation in healthy and diseased models: influence of different types of exercise (H.M. Alessio). Metal binding agents: possible role in exercise (R.R. Jenkins, J. Beard). The role of xanthine oxidase in exercise (Y. Hellsten). Acute phase immune responses in exercise (J.G. Cannon, J.B. Blumberg). Oxidative DNA damage in exercise (A. Hartmann, A.M. Niess). Part IV: Antioxidant defenses. Physiological antioxidants and exercise training (S.K. Powers, C.K. Sen). Superoxide dismutases in exercise and disease (K. Suzuki et al.). Antioxidants and physical exercise (C.K. Sen, A.H. Goldfarb). Part V: Nutrition. Dietary sources and bioavailability of essential and nonessential antioxidants (E.A. Decker, P.M. Clarkson). Vitamin E (M.G. Traber). Part VI: Cellular and molecular mechanisms. Biological thiols and redox regulation of cellular induced signaling (C.K. Sen). Regulation and deregulation of vascular smooth muscle cells by reactive oxygen species and by &agr;-tocopherol (A. Azzi et al.). Part VII: Analytical methods. Oxidative stress indices: analytical aspects and significance (D. Han, S. Loukianoff, L. McLaughlin). Noninvasive measures of muscle metabolism (T. Hamaoka et al.). Part VIII: Environmental factors. Air pollution and oxidative stress (D.M. Meacher, D.B. Menzel). Risk of oxidative stress at high altitude and possible benefit of antioxidant supplementation (I.M. Simon-Schnass). Oxidants in skin pathophysiology (S.Weber). Part IX: Organ functions. Muscle fatigue: mechanisms and regulation (M.B. Reid). Oxidative stress in muscular atrophy (H. Kondo). Protection against free radical injury in the heart and cardiac performance (D.K. Das, N. Maulik). Exercise-induced oxidative stress in the heart (L.L. Ji). Influence of exercise-induced oxidative stress on the central nervous system (.M. Somani, K. Husain). Part X: Aging. Oxidants and aging (K.B. Beckman, B.N. Ames). Caloric restriction, exercise and aging (R.J.M. McCarter). Oxidative stress and the pathogenesis of sarcopenia (M.E. Lopez et al.). Molecular mechanisms of oxidative stress in aging: free radicals, aging, antioxidants and disease (M. Pollack, C. Leeuwenburgh). Part XI: Disease processes. Oxidative stress, antioxidants and cancer (M. Gerber). Alcohol and oxidative stress (C.S. Lieber). Cigarette smoking as an inducer of oxidative stress in relation to disease pathogenesis (G.G. Duthie, J.R. Arthur, S.J. Duthie). Regulation of inflammation and wound healing (J.J. Maguire). Oxidative stress induced by the metabolism of medical and nonmedical drugs (M. Paolini, G. Cantelli-Forti). The paradoxical relationship of aerobic exercise and the oxidative theory of atherosclerosis (R. Shern-Brewer et al.). Claudication, exercise and antioxidants (P.V. Tisi, C.P. Shearman). Exercise and oxidative stress in diabetes mellitus (D.E. Laaksonen, C.K. Sen). Exercise induces oxidative stress in healthy subjects and in chronic obstructive pulmonary disease patients (J. Viña et al.). Hypoxia, oxidative stress and exercise in rheumatoid arthritis (S. Jawed et al.). Index of authors. Subject index.